In the first collection of its kind, Timothy Murray brings together writing by leading French thinkers on the political effects of theatricality on theater, film, literature, philosophy, and psychoanalysis. In addition to recently translated work by Cixous and Deleuze, the collection features English translations of essays by Althusser, Derrida, Durand, Fanon, F ral, Foucault, Girard, Green, Irigaray, Kristeva, Lacoue-Labarthe, Lyotard, and Marin. Mimesis, Masochism, & Mime provides a welcome theoretical contribution to recent theories of performance and to the development of French cultural studies. Its emphasis on the politics of theatricality lends unprecedented focus to French theorizations of the body, gender, sight, screen, voice, territoriality, otherness, and diversity. In so doing, the volume provides an intellectual context and theoretical blueprint for future work in the cultural study of mimesis, masochism, and mime. The collection highlights the importance of theatricality to the theory and practice of aesthetics as well as to French debates over patriarchy, absolutism, and metaphysics. In turn, wide-ranging analyses provide a range of approaches to the politics of identity, feminism, marginality, and postcoloniality. Timothy Murray's introduction makes clear the theoretical context of the volume, and situates the book in relation to recent Anglo-American debates over realism, multiculturalism, and identity politics. The contributors are especially helpful in linking varying political accounts of ideology, philosophy, and psychoanalysis to historical and contemporary work in performance, film, and video. Astute commentaries on Sophocles, Shakespeare, and Artaud are combined with fascinating analyses of more recent mixed-media performance, from the European stage (Duras, Th tre du Soleil, Bene, and Strehler), to the site of North American performance (Snow, Mabou Mines, Wilson, and Rainer). 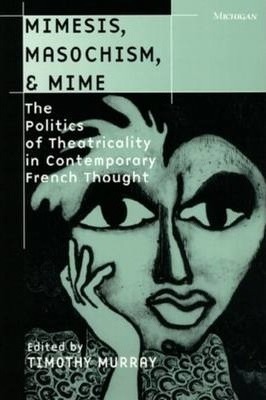 Mimesis, Masochism, & Mime provides a stunning account of the political importance of theatricality to contemporary French thought and will be welcomed by readers in French studies, theory, theater, cultural studies, film, women's studies, aesthetics, and psychoanalysis. Timothy Murray is Professor of English at Cornell University and former Editor of Theatre Journal. He is the author of Theatrical Legitimation: Allegories of Genius in Seventeenth-Century England and France and Like a Film: Ideological Fantasy on Screen, Camera, and Canvas.